10,000 steps averages out to about five miles (depending on your stride length). That means that by the end of the month you've walked about 150 miles. 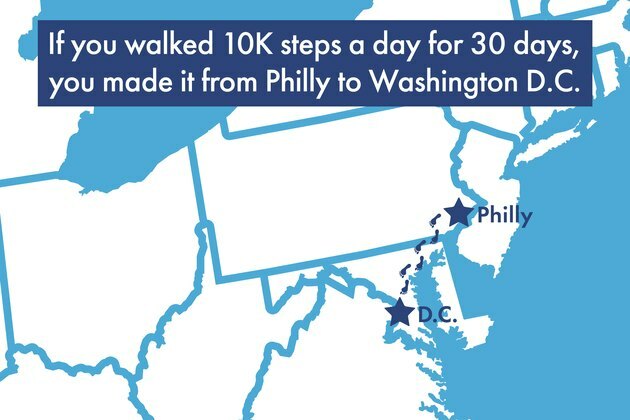 That is the distance from Philadelphia to Washington, D.C. It is slightly less than the distance from Houston to Austin. It's about as far as San Diego to Los Angeles if you take Interstate 15 (according to Google maps). Your turn! What's 150 miles away from your hometown? What about if you turned those walking steps into climbing steps? Here's how your daily steps stack up to some of the world's tallest staircases and buildings. The longest staircase in the Guinness World Records can be found going up Niesen Mountain in Switzerland. But at 11,674 steps, it's pretty close to the daily target. The current tallest building in the world — Burj Khalifa — has 2,909 steps to get to the 160th floor. Visitors aren't allowed to use the stairs, but it's an interesting thought when you look down at your pedometer and see 3,000 steps to know that you could have reached the top. Every year the Empire State Building hosts a race up it's 1,860 steps. The fastest time was 9 minutes and 33 seconds. Alright, so walking steps and climbing stairs aren't necessarily a one-to-one comparison, but you get the idea. But if they were, how many Empire State Buildings could you climb in one day, given your average step count? Now for something a little more applicable to your daily life — calories burned! That depends on a lot of factors, but the American Council on Exercise (ACE) estimates that the average person burns 3,500 calories per week walking 10,000 steps a day. So that's 500 calories a day! But the more you turn up the intensity, the more calories you burn. If instead of focusing on shorter stints around your home or office (which still count toward your daily total number) you started taking more brisk walks around the block, you'd go from burning around 70 to 120 calories to 150 to 220 in 30 minutes (based on a 125-pound and 185-pound person). Have you been tracking your calories? How many extra per day have you burned since upping your step count? Now Go for the (Personal) Gold! The first week of this challenge you got a baseline number for about how many steps you typically walked in a day. Now, in the final week, it's time to see how far you can go! Challenge yourself to add an additional 30-minute walk to your day or commit to a weekend hike (weather permitting, of course). We know you can't spend all day every day walking, but pick one day — maybe the last day of the challenge — and go for that daily step count record. Then share it with the Facebook Challenge Group! We want to hear about how far you walked and where. Did you find a gorgeous hiking trail? A fun farmers market to stroll through on the weekend? Or a new park to take the kids or pups to?